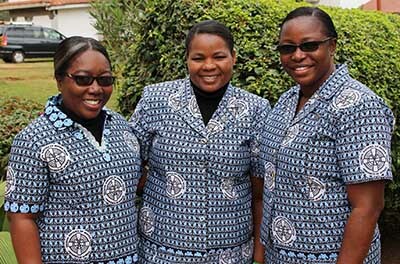 From left: Sisters Victoria Swanzy-Essien (councilor), Joyce Kwamboka Nyakwama (provincial leader) and Grace Okon (councilor). The School Sisters of Notre Dame Province of Africa installed a new provincial council on the Aug. 28, 2015, the Feast of St. Augustine. Sisters from Kenya and assembly delegates from the Gambia, Nigeria, Ghana and Sierra Leone attended the installation ceremony at Mary Ward Centre in Nairobi, Kenya. The Eucharistic celebration was led by Father Ambrose Anane, SDB. Sister Joyce Kwamboka Nyakwama was installed as the provincial leader, and Sisters Victoria Swanzy-Essien and Grace Okon were installed as the provincial councilors. The new council also received a symbolic gift from the sisters of the province: a curved image of a hand holding an egg. It was a message to the new council to hold the lives of all the sisters of the province with both firmness and gentleness. Sister Joyce is originally from the southwestern part of Kenya in East Africa. She has been an SSND for about 21 years. Sister Joyce has served as a teacher, a principal at St. Theresa’s Girls Secondary School (Gekano) and St. Francis Girls Secondary School (Kiptere) in Kenya. Most recently, she was the principal of Notre Dame Girls Secondary School, Mkar, in Benue State, Nigeria. Sister Victoria grew up in the matrilineal Fanti culture in the central region of Ghana, West Africa. In this area, the girl child is the heartbeat of the family. Sister Victoria, the eldest of two girls, grew up with her maternal grandparents, wisdom figures who instilled in her strong cultural and gospel values. For Sister Victoria, being a School Sister of Notre Dame for the past 20 years has been both exciting and life-giving. She has had the opportunity to participate in bonding and international programs and work with women in vocation and affiliate ministries. She has served on district assemblies. As a nurse practitioner, she has ministered at bedsides in wards and emergency units. “St. Peter Fourier is my mentor in the SSND world, and I totally agree with our foundress Blessed Theresa that ‘Love is the sign through which the world should be convinced that we believe in Jesus,’” Sister Victoria said. Sister Grace was born in Nigeria, West Africa, and is the oldest of now nine surviving children. Sister Grace made her first profession 1993 and her perpetual profession in 1999. She has served in several ministries in Africa, including teaching formation and administration at the SSND secondary school in Mkar, Nigeria. Sister Grace served as novice director at the African Novitiate in Ghana and on the first provincial leadership team as a provincial councilor. “Working in different places has helped me to learn and appreciate others’ background and culture,” Sister Grace said. “The opportunity to serve in the novitiate and leadership was a gift to me. I have come to treasure these experiences as grace-filled. It is Grace’s hope that the Province of Africa will continue to be a witness to the unity that SSND Foundress Blessed Theresa Gerhardinger stood for.